A student art competition for Louisville Metro students to showcase their talents and celebrate the Kentucky Derby experience! 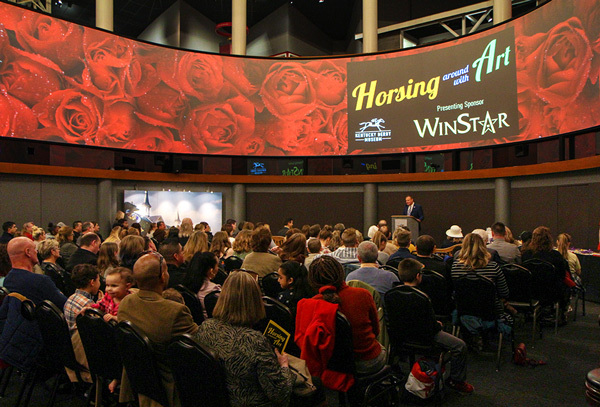 Kentucky Derby Museum is pleased to announce the grand prize winner of the Horsing Around With Art competition, presented by WinStar Farm. McKayla Rakestraw, a junior at Mercy Academy, was awarded the top prize out of more than 220 entries from 30 Metro Louisville schools. Rakestraw’s painting, featuring the iconic Twin Spires, signature Kentucky Derby red roses surrounding a horse and jockey reflected in the Derby trophy under a sky inspired by the style of Vincent Van Gogh was judged to best “capture the spirit of the Kentucky Derby”. She won six box seats to Kentucky Derby 145 and her artwork will be professionally framed and displayed in the Museum for one year. Mercy Academy’s art department will also receive $500 for art supplies. Other distinctive and divisional award winners were also announced today. For a complete list, click here. WinStar Farm, one of Kentucky’s premiere Thoroughbred Breeding and Racing Operations, captured their second Kentucky Derby with the 2018 Triple Crown Winner Justify. To celebrate their historic victory, we have created “The WinStar Award” that will be judged to be “the favorite of the farm” for the 2018-19 HAWA Exhibit. Prizes include a private tour of WinStar Farm and $200 to the winning art department. Will count as 1 of 5 entries per division. Millinery is a centuries old art form of hat making and a great Derby Day tradition. In collaboration with Jenny Pfanenstiel, owner of Formé Millinery and Official Milliner of the Kentucky Derby Museum, we have created the “Millinery Fashion Award” for the pieces that “best embody Derby fashion” for our 2018-19 HAWA Exhibit. Prize includes a private “Speed Fascinator Workshop” led by Jenny at her studio. Up to 6 students will be awarded. Will count as 1 of 5 entries per division. This award is a permanent addition to our HAWA Exhibit in honor of Winston, the Museum’s miniature horse who stood as companion animal for over two decades to several retired Thoroughbreds including the 2009 Kentucky Derby Winner Mine That Bird. The Winston Memorial Award will best “illustrate the importance of companionship in the horse’s life provided by either humans or other animals.” Prizes include $500 to the winning art department and a tour of Old Friends Farm, a premiere Thoroughbred Retirement Farm in Georgetown, KY and Winston’s final home, for the winning student. Will count as 1 of 5 entries per division.